Williams, Cheryl. "Mary Spencer". The Canadian Encyclopedia, 24 July 2015, Historica Canada. https://www.thecanadianencyclopedia.ca/en/article/mary-spencer. Accessed 23 April 2019. Mary Spencer, boxer, model, humanitarian (born 12 December 1984 in Wiarton, ON). Mary Spencer is one of Canada's premier boxing champions, holding eight national titles, five Pan-American titles, and three world titles. Mary Spencer, boxer, model, humanitarian (born 12 December 1984 in Wiarton, ON). Mary Spencer is one of Canada's premier boxing champions, holding eight national titles, five Pan-American titles, and three world titles. An Ojibwe of the Cape Croker First Nation, Spencer is involved in Motivate Canada’s GEN7 Aboriginal role model initiative, and in 2013 became a mentor with the CIBC Team Next program. An Ojibwe from the Cape Croker First Nation, Spencer was the fourth of five children, born in Wiarton, ON. Her family moved around often, and Spencer called Big Trout Lake, Detroit, and Owen Sound home before settling in Windsor, ON. Spencer became involved in sports at a young age, taking part in basketball, volleyball, soccer, track and field, and cross country during her school years. In 2002, at the age of 17, Spencer began boxing at the Windsor Amateur Boxing Club; within a few months she was training under three-time Olympic coach Charlie Stewart, who noted Spencer's hard work and athleticism. Five months later, Spencer won her amateur debut match, and in 2003 became Ontario's 66 kg champion. In 2004, a mere 18 months after taking up the sport, Spencer won her first of many Canadian championships in the 66 kg weight division. In 2004 Spencer won tournaments in Italy, Poland, and Taiwan, increasing her skill as a boxer and broadening her list of competitors. Spencer's success in national and international competition continued the next year, when she went undefeated for a second season. In addition to defending her national title in 2005, she won her first Pan-American championship in Argentina and her first world championship in Podolsk, Russia. Spencer’s international reputation grew, and she quickly became known as one of the world's finest boxers. In 2006 Spencer suffered her first international loss, but won a bronze medal at the World Championships. World titles continued to elude Spencer in 2007, although she won a gold medal at the Pan-American Championships in Guayaquil, Ecuador, as well as her fourth Canadian championship, and took silver at the Witch Cup in Hungary, and at the Ahmet Comert Cup in Turkey. Spencer dominated international competition in 2008; in addition to winning her fifth Canadian title, she was undefeated internationally throughout the season. She also claimed her fourth Pan-American title that year, and returned from the World Championships with her second world title. 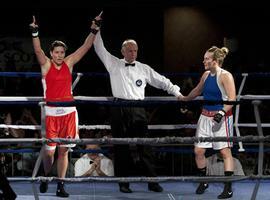 In recognition of her success, she was named Canadian Boxer of the Year for the fourth time. In 2009, the (amateur) International Boxing Association — also known as AIBA — implemented new weight divisions for female boxers; Spencer dropped from the old 66 kg class to the new 64 kg class. Despite the change, she took the Canadian championship in the new division. That same year, however, Olympic weight divisions were announced; there would be only three weight classes (51 kg, 60 kg, 75 kg) for women instead of the usual eight, and Spencer chose to train for the 75 kg division. At the 2010 Canadian Championships, Spencer came in second in the 75 kg class to her friend Ariane Fortin; in previous years, the two had fought in different weight classes, but both were now aiming for a spot at the Olympics. In international competition, Spencer won three gold medals in 2010 — at the Pan-American Championships in Brazil, the Minoan Cup in Greece, and the World Championships in Barbados. Spencer’s Olympic debut in 2012 was disappointing. Earlier in the year, she lost her first fight at the world championship tournament, thus failing to qualify for the Games, but was later given a wild card berth for the competition. Women's boxing premiered at the 2012 Summer Olympics in London, England, where Spencer competed in the 75 kg weight division. Although Spencer was a favourite for the podium, she lost a 17–14 decision to Li Jinzi of China in the quarter-finals, an unexpected loss which some attributed to fatigue and the pressures of media attention. By the 2012 Olympics, Spencer had become a Canadian celebrity and spokesperson for women’s boxing; she also signed on to be a CoverGirl model in 2012, and made numerous media appearances in the build-up to the Olympics. Spencer’s loss at the Olympics did not dampen her enthusiasm for further competition, and in 2013 she began training under a new coach, former professional boxer Kara Ro, for both the 2015 Pan-American Games in Toronto and the 2016 Summer Olympics in Rio De Janeiro. Outside of sport, Spencer is a member of Motivate Canada's GEN 7 Aboriginal role model initiative. Through this program, she has developed sport, physical activity, and empowerment programming with Aboriginal youth in First Nations communities in Ontario. In 2013 she became one of six elite athlete mentors with the CIBC Team Next program, which provides funding and mentorship to young athletes who hope to represent Canada on the world stage. Mary SpencerA profile of Canadian boxer Mary Spencer from the website for the Canadian Olympic Committee.